Food Network host Guy Fieri (at left) with Bernard Weber (right) and others filming of “Diners, Drive-Ins and Dives” in Kahului. ISLE SPOTLIGHT . . . 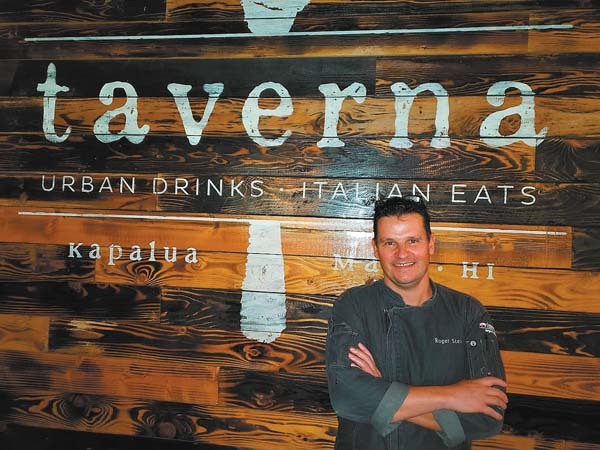 In March, the Food Network contacted a few Maui restaurant and food truck owners — and in April, it filmed on island. 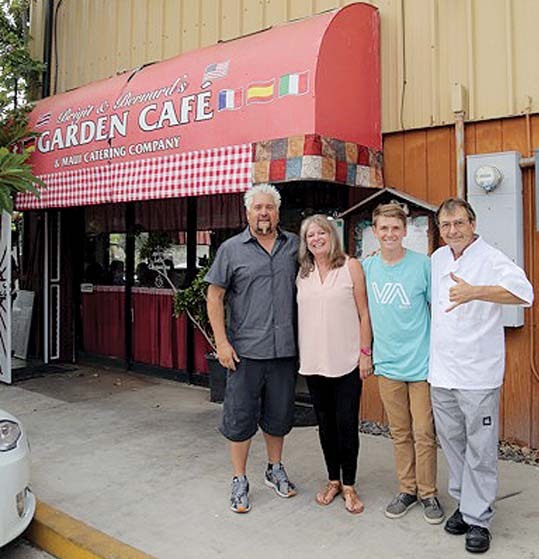 On Friday, Season 27, Episode One of “Diners, Drive-Ins and Dives” will put the German-Swiss fare of Brigit & Bernard’s Garden Cafe in Kahului in the spotlight at 6 p.m., repeating at 9 p.m.
Weber wowed with beef rouladen with spaetzle and braised red cabbage; wiener schnitzel; chicken Cordon bleu; bratwurst platter; fresh catch; and old-fashioned apple strudel. Maui will be on the following two episodes as well. Stay tuned. And Brigit & Bernard’s will present its Swiss Fest on Aug. 1 with an authentic all-you-can-eat buffet and live alpine music by the Dorfmusikanten. The University of Hawaii Maui College Culinary Arts Program will reinstate its Thursday Back Door Bake Shop from 1:30 to 4:30 p.m. today and July 13 and 20. Just go to Pa’ina Building’s back door. This week, you may purchase sourdough brioche, and gibassier and panettone (French and Italian sweet breads). 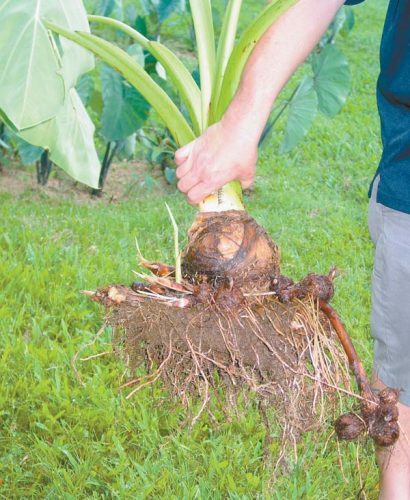 Full-time nutrition professor Timaree Hagenburger will present the “Get Your Family to Love Plant-Based Whole Foods” lecture at 7 p.m. July 13 at the Mayor Hannibal Tavares Complex at 91 Pukalani St., Upcountry. Hagenburger is a professional speaker working in corporate wellness and she will offer, “strategies and inspiration for finding pleasure in the preparing and the partaking of nourishing meals,” according to Jerome Kellner, publicist. Down to Earth will offer refreshments at this free presentation by the Vegetarian Society of Hawaii. For more information, call 385-2970 or visit www.vsh.org. 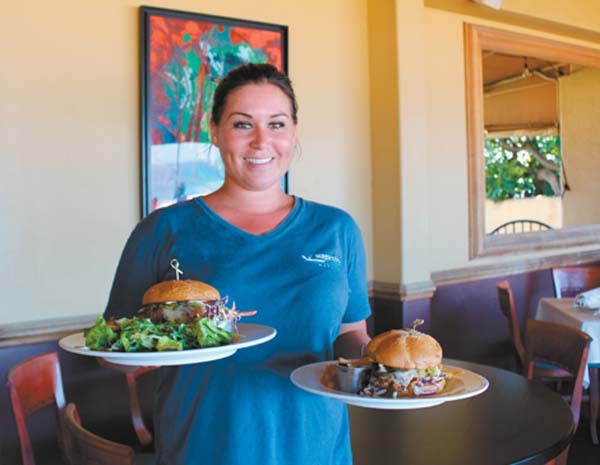 Starting tomorrow, Seascape Maalaea Restaurant at the Maui Ocean Center will add Friday nights to its weekend dinner service lineup. Dinner items include broiled ahi steak served with saffron cream sauce and grilled shrimp; meaty mango-hoisin barbecue ribs and Asian-style bouillabaisse packed with lobster, shrimp, Manila clams, crab claws and scallops. Pau Hana hour runs from 5 to 7 p.m. with wine and draft beers discounted and some fun pupu, too. 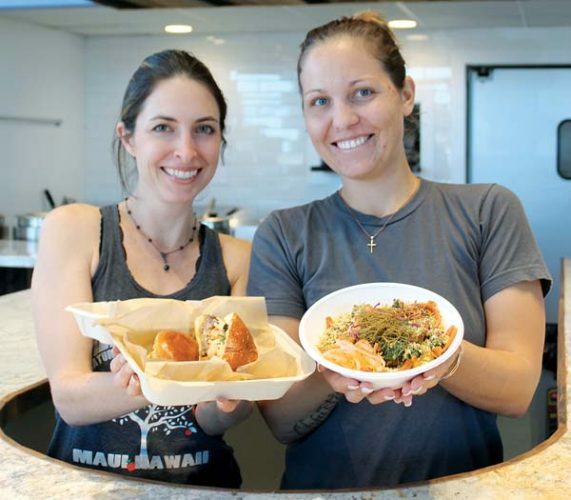 Sugar Beach Events in north Kihei will shake up summer with a host of cooking classes and events. 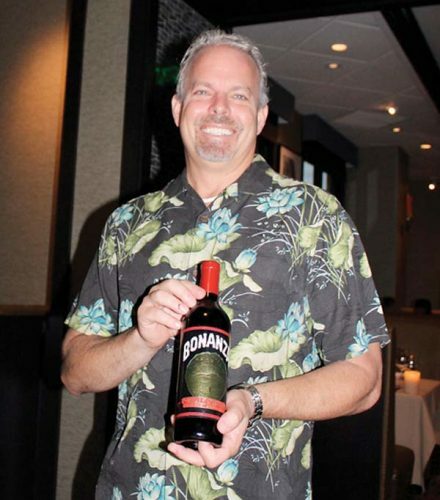 Maui mixologist Carl Anderson will let you roll up your sleeves for Bartending Basics on July 16 and 17. Two classes on Summer Baking for Kids will be on July 19; and for adults, there will be the Seafood with Style class making a splash Aug. 14. To register, email lee@sugarbeacheventshawaii.com. 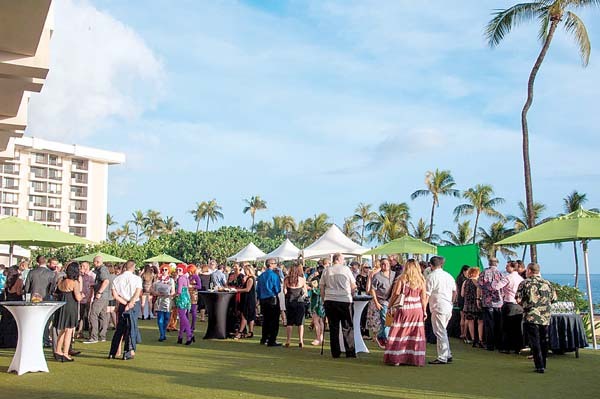 PAU’s master distiller, Mark Nigbur, will be on hand to educate attendees about his locally made vodkas, gins and whiskeys July 13, 27 and Aug. 10 and 24 at Black Rock Kitchen in the Sheraton Maui Resort & Spa in Kaanapali. Chef Chris Lederer will create fun pupu to pair with the craft cocktails to be made by a guest mixologist. Those who stay for dinner get 25 percent off food those evenings.